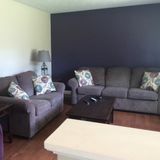 I am an interior painter operating out of Durham Region. I am a hard working, friendly and trustworthy individual. My goal is to work with the client to ensure that they are getting the perfect room makeover at a fair price. I also install and remove wallpaper in an efficient manner. I am available to consult on colours that will suit your personality and space. I also offer free estimates.